Samsung is keeping up with its favorite advertising pastime: beating up on Apple. A new spot from 72andSunny takes aim at the iPad Air, poking fun at the grandiose Apple commercial, voiced by Bryan Cranston, that played hide the skinny tablet behind a pencil. In Samsung's cheekier version, the pencil isn't starting poems or finishing symphonies. It's cheating at golf, and getting stuck in ceilings. 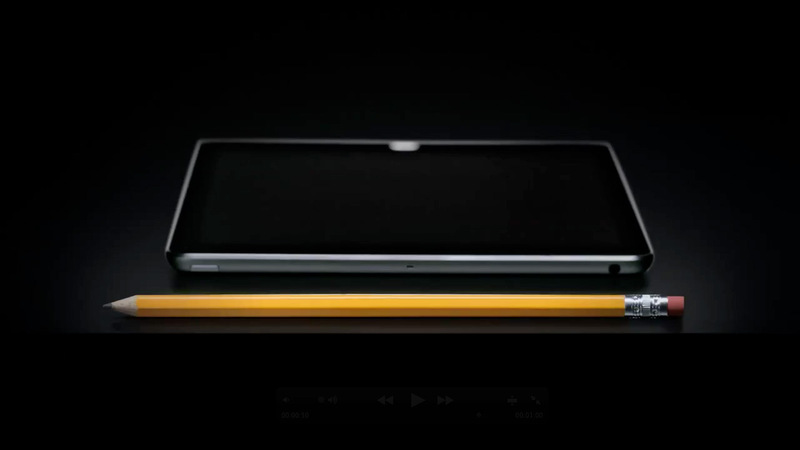 And hiding behind the iPad Air is an "even thinner" Galaxy tablet, with all kinds of extra whiz-bang features. Given that Apple pretty much invented—and still leads—the category, it's a bit of an odd choice for Samsung to literally position its product in its rival's shadow. (As pretentious as Apple's tone can be, the brand does have some bragging rights as far as shaping culture goes.) Then again, Samsung's strategy seemed to work pretty well in the smartphone space, and the brand is gaining on Apple in tablet share—it's hard to argue with success, even if Samsung is starting to sound more smug itself. A second new Samsung spot offers a side-by-side comparison of LeBron James on an iPhone and a Galaxy smartphone. That ad does a better job of staying out of its own way and getting to its point (simply put, that the Galaxy is way better). Still, it's hard to see a stylus pen without thinking of a Palm Pilot … and nothing says 2014 like Palm Pilot.